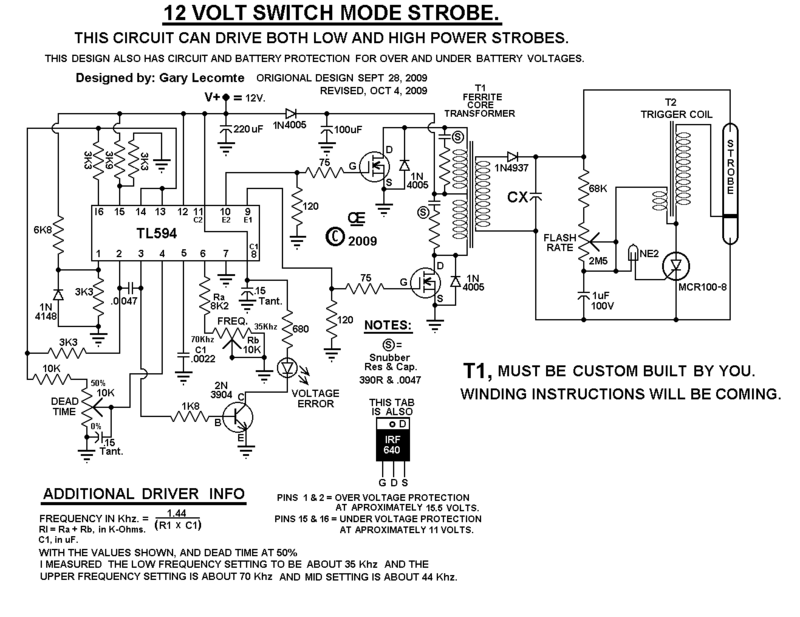 A Switching Supply, 12 Volt Strobe. This Article Created, "Sept, 28 2009"
Latest Update, "Oct, 7 2009"
Basically All the INFO IS HERE Now, BUT I may add some MORE Info. 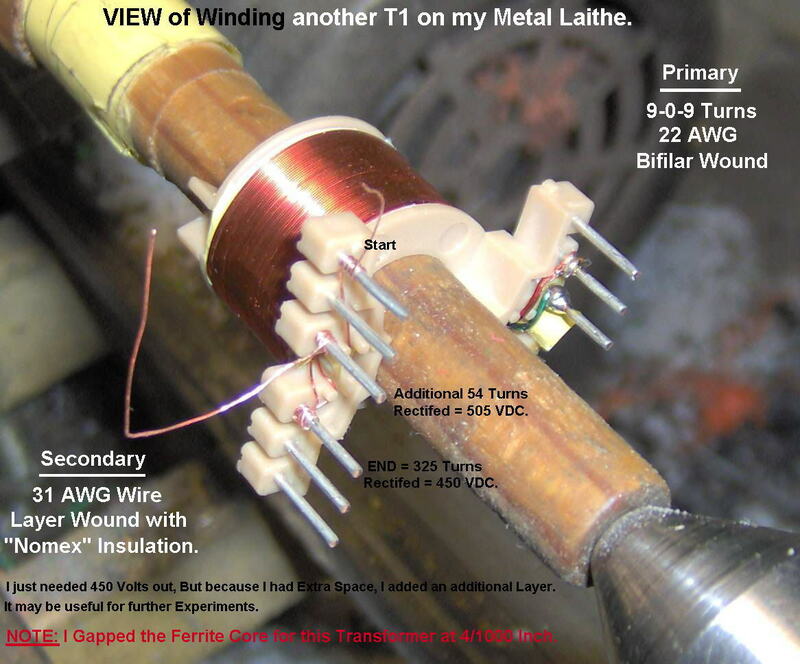 As I have now Ordered some Larger Cores to make some More Powerful transformers. These have a somewhat Larger Bobbin, so it will also require a bit Larger PCB. 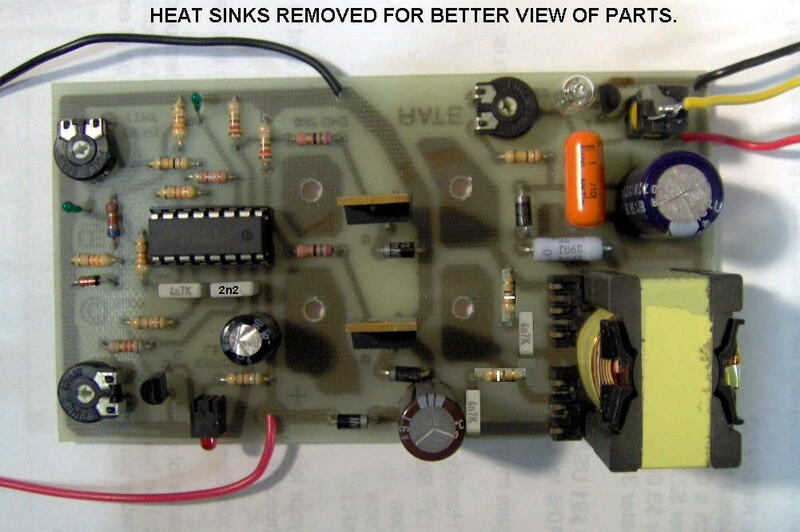 Use Extreme Caution when building and using this circuit. And the Capacitor "CX" Will still have a Substantial Charge, After the Battery power is Removed. These Voltages at the Currents available May Kill You! 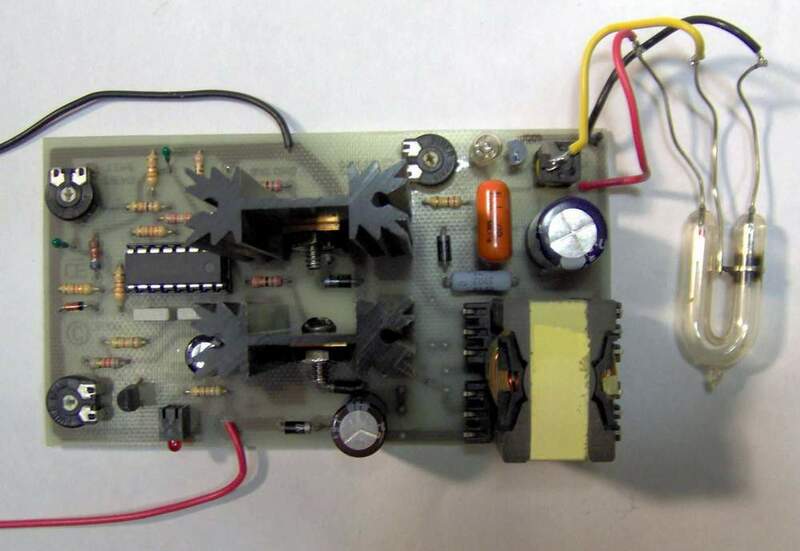 This circuit can provide a Very High Powered Strobe, for a variety of Portable Uses. and Dead Time Settings you choose. T1 is a Custom Made Ferrite Core Transformer, Which you must wind yourself. 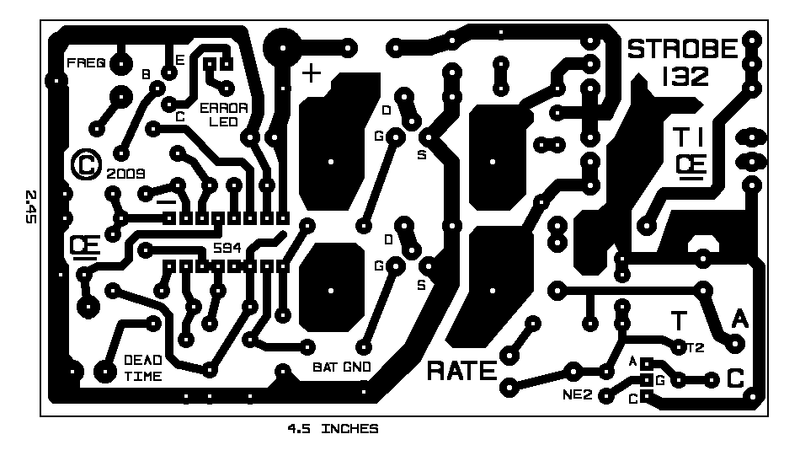 And many other Parts, For the Circuit as Shown here." (CX on the Schematic) can be used in Parallel to increase the storage current. Output Voltage depends on the number of Secondary Windings of T1. as needed by the strobe Tube you have. However the Higher the Capacitance of CX, the shorter the tube life. Especially if the Watt Seconds Exceed the Specifications of you tube. keep the Mosfets cool. The heatsinks I show are only suitable for somewhat lower powers. It is Impossible to create a Design that suits Everyones Needs. of around 300 volts and has an estimated life expectancy of 1,000,000 flashes. But there are MANY, Much Higher Strobe Tubes Available from various sources. "The Deadtime Control" Determines Pulse Width which controls Drive Current. "The Frequency Control" Determines Frequency of Oscillation. Depending on how you wind T1, Increasing Frequency may help for faster charging. for you, Change the 68K resistor to a 220K or higher,to Slow it down. Or Possibly use a 2M5 Pot for a Wider Range of adjustment. Typical wattage ratings for these tubes are measured in "Joules" or "Watt Seconds". Watt Seconds = ((Volt2) X (Capitance in Farads))/2. CLICK HERE, To read a Letter about this, from a reader"
Note: The "Snubber" Values Shown, Will Vary with Different Transformers. I plan to put Part Values on this, in the near future. Proto Strobe, Connected to Small 4 Joules Strobe Light. Sorry this is the only bulb I have at this time. 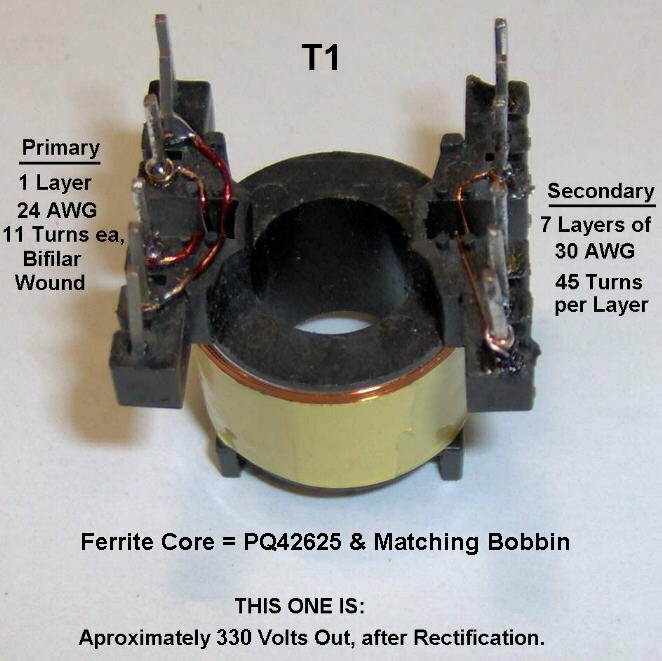 "First Test Transformer, used on this Prototype"
This Bobbin is a PC-B2625-LA, Made by "Magnetics"
"Another Transformer I Made, for 450 VDC"
Also this same Bobbin, PC-B2625-LA, Made by "Magnetics"